The protesters who descended on Fort Meade military base in Maryland to express frustration with the trial of Bradley Manning have been joined by major American celebrities and journalists, who are also rallying support for the Army whistleblower. Manning, 25, could spend the rest of his life in prison if convicted of aiding and abetting the enemy by leaking military cables to WikiLeaks. US military prosecutors have asserted that Manning put his own agenda above national security and that by releasing the cables, most notably the Collateral Murder video depicting an American helicopter opening fire on Iraqi civilians, he jeopardized Americans in the field of battle. But his trial at Fort Meade this week has attracted the attention of influential Americans, as well as international activists who opposed the American wars in the Middle East and beyond. 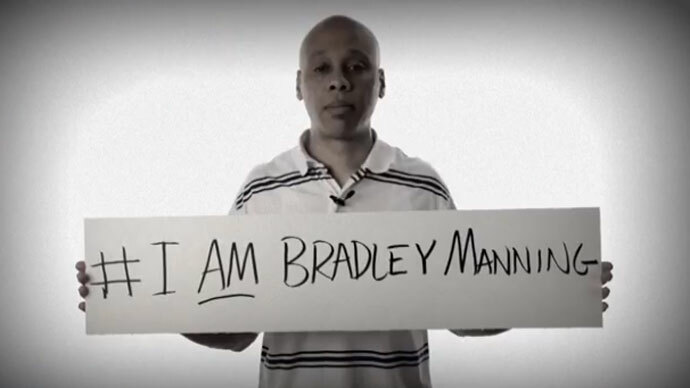 The “I Am Bradley Manning” campaign, featuring a video trailer of A-list celebrities and public thinkers voicing support for Manning, pushed viewers to consider if they themselves would have the courage to disclose military video footage in order to stop the carnage. Actors Russell Brand, Maggie Gyllenhaal and Wallace Shawn join Oliver Stone, Rage Against the Machine guitarist Tom Morello, and journalists Chris Hedges, Matt Taibbi and a slew of others who lend Manning their support. Daniel Ellsberg, the former US Defense Department employee who leaked the Pentagon Papers during the Vietnam War, is also featured. Supporters also made themselves known outside the trial at the main gates of Fort Meade. Michael Thurman, a former member of the US Air Force, told the Daily Beast he flew in from Oakland, California to personally witness the events. “”I think what Bradley Manning did was pretty heroic and selfless, and I want to do everything I can to support someone who is willing to sacrifice everything so we can all know the truth about US foreign policy and what this government is doing,” he said. European groups have also sided with Manning. The former Army Private first-class admitted in February that he provided a large number of classified documents to WikiLeaks, but that confession came after nearly three years of detention, where Manning was monitored as he stewed in solitary confinement for an entire year. Joshua Benton, the director of Harvard University’s Nieman Journalism Lab, explained to the Associated Press why the American press has been more “uniformly unsympathetic” than their European counterparts. Will Jordan Bratman also join the cause?